Andrew T Ferguson died on 1st March 2016, at the age of 87. 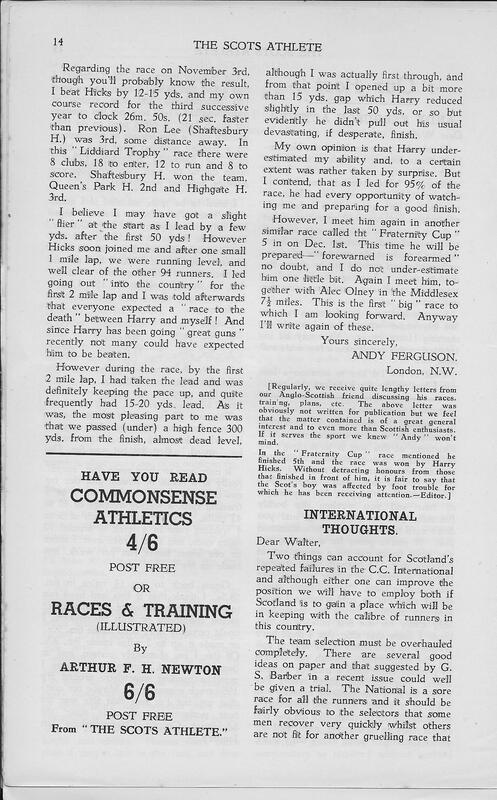 A member of English club Highgate Harriers, he had a fairly long athletic career but although he was undoubtedly a very good runner, he never held a Scottish championship title or won any cross-country representational honours. Indeed he hardly ever ran in Scotland yet won a Scottish vest on the track and finished second in the national. Unfortunately he was not in the line-up on the day but his ability that had earned Emmet’s high opinion was there for all to see during the summer. His running over the summer was all done south of the border but in the AAA’s championships, won by Lucien Theys of Belgium, he was second to Olney in a blanket finish with the places and times being 1. L Theys 14:07; 2. A Olney 14:11.2; 3. A Ferguson 14:11.6; 4. W Lucas 14:11.6; 5. F Green 14:14.6. At the time his 14:11.6 was a Scottish best but because of the rules existing at the time, it was not officially recognised as a record. Not selected for the European Games, Ferguson was, however, selected for Scotland in the international against England, Wales and Ireland at 5000m. The other Scot was Tommy Tracey and they finished third and fourth with Ferguson timed at 15:34.2 for third. First and second were Olney (14:48) and Lucas (14:56.8). In the summer, 1950, Ferguson represented Scotland in the international against England, Wales and Ireland at 3 miles , finishing 3rd. That year, he was second to the Belgian Lucien Theys in the AAA Championship 3 miles in 14:11.6. At the time, the performance was a Scottish best although it was not officially recognised as a record because of the rules in force at the time. Unfortunately Ferguson was missing when the national was run and was not in the team for the international. Walter Ross who founded, printed, wrote for and subsidised “The Scots Athlete” was a wonderful man. In addition to all that, doing his day-job, having a happy family life, running almost every day of the week, he kept up a correspondence with may people all over the world. It was natural that he should start writing to Andrew Ferguson and in December, 1951, he published this letter from him. As he says, it was not written to be printed, but he took the correct decision I think in letting us see it. “A “GRAND” NATIONAL. There are prospects of a very keen race in the National both for the individual honour and international places. The individual race may resolve itself into a contest between Eddie Bannon of Shettleston Harriers and the grand Anglo Scot Andrew Ferguson of Highgate Harriers, with odds on the former pulling it off. With some trepidation, I select the following as my first six home and in this order: 1. E Bannon (Shettleston); 2. A Ferguson (Highgate; 3. A Forbes (Victoria Park); 4. T Tracey (Springburn Harriers); 5. T Stevenson (Greenock Wellpark); 6. CD Robertson (Dundee Thistle). Result: 1. E Bannon (Shettleston ) 49:24; 2. AT Ferguson (Highgate H) 50:21; 3. T Tracey (Springburn H) 50:34; 4. A Forbes (VPAAC) 51:03; 5. T Stevenson (Greenock Wellpark) 51:16; 6. CD Robertson (Dundee Thistle) 51:29; 7. I Binnie (Victoria Park); 8. AC Gibson (Hamilton H); 9. CD Forbes (Victoria Park); 10. A Black (Dundee Hawkhill). Emmet had the first six exactly right with only Forbes and Tracey switching places. Unfortunately Ferguson did not run in the SAAA championships and was unplaced in a very good AAA title race but by the end of the season he had four very good times which placed him high in the Scottish rankings, all run in England. For the mile he had a season’s best of 4:22.7 (3rd best Scot behind K Coutts, EUAC, and J Hendry, Elgin AAC); for two miles he ran 9:31.6 (4th behind Bannon, Calderwood and Forbes); 14:27.6 for three miles (second behind Andy Forbes); 30:41.6 for six miles (second behind Ian Binnie ). In 1953 there was no sign of Ferguson north of the border: he did not run any cross-country up here, nor was he seen on the track. Not at the championships nor at any of the big invitation meetings. He may have missed the season through illness or injury or been out of the sport for some reason but he was not ranked in the mile (where the list went down to 4:25.6); the three miles (down to 14:59.8) or the six miles where there were only two times ranked. (Binnie 28:53.4) and Breckenridge (31:58.0). That seemed to be it as far as his participation in Scottish athletics was concerned – in truth he had never competed much here. Despite the number of Scots at invitation meetings such as Edinburgh Highland Games or the Rangers Sports, and even when a AAA’s team competed here, AT Ferguson was not to be seen. His appearances over the country were almost as rare. He did continue to compete right on to the veteran stage – note the obituary by Alistair Aitken below – and he ran a good London marathon in 2:39:48 at the age of 53. Andy Ferguson, one of the older Highgate Harriers, was a real lively character. He sadly died on the 1st of March. Andy was passionate, in his days, for Highgate Harriers not to amalgamate. He thought they stood better alone. Andy Ferguson had a long athletic career, and he went on to run a good London marathon, as an M50. At 53 he ran 2:39.48 but, his fame was long before that. He won the Junior North of Thames in 1948 and, the strongly contested, Senior North of Thames cross country Championships in 1951. 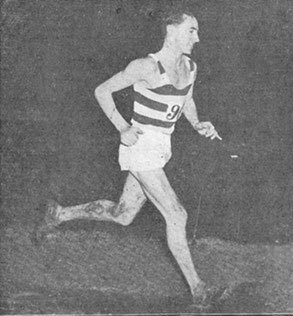 He represented Scotland, as a cross country international, coming second in their Championships in 1952 and, back in 1950 he ran 14.11.6 for 3 miles in the AAA’s Championships at the White City, coming second to the Belgian Lucien Theys who ran 14.09.0. Before that, he set a Scottish 3 miles Scottish Native record in 1949, when he was 3rd in the AAA’s in 14.11.02. 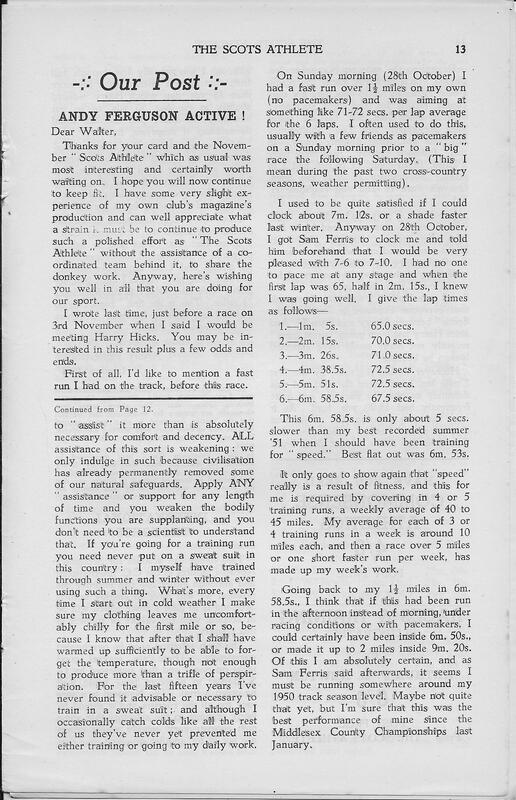 Ferguson also ran in races at the White City with Pirie and Zatopek. The latter he congratulated when Emil won and, said how nice Emil Zatopek was. Andrew Thomson Ferguson, b. 7 November 1928, d. 1 March 2016.